Louisiana's Premier RV Destination! Enjoy world-class amenities: huge concrete pull thrus, two pools, luxury cabanas, lazy river & tiki bar, Giant outdoor hot tub, restaurant, lake activities and fun for the whole family! First off this is a mostly brand new park. Unfortunately, I think it is a little overpriced. $65 for a pull thru in a part of the country and State of Louisiana where there is not allot to do or see. Most people who RV look for places to visit and explore. About 30 miles from Baton Rouge and a little farther to New Orleans. Staying at Reunion Lake, you had better have a FAT Wallet. They charge for everything! Internet $7.50 per day, Golf Cart Rentals $75.00 per day. To Swim in the Man Made Lake, $25 per day. Only Free things are the Lazy River and Swimming Pools. We thought it to be a nice experience to stay here, but after 2 days of out 3 days, we left early and forfeited out last day. This is one PARK we will not be returning too in the future. This was a great park. Easy access on and off the interstate. We only stayed two nights, but would love to return during their season to take full advantage of their swim up bars. We did enjoy the pool, spa, and lazy river. Would definitely recommend this park and will stay here again. Great campground. Have stayed here during the summer and always had positive experience. Stayed here in November and it was very quiet during the week. Not happy about restrooms being closed during building renovation that were normally open. Our site was pretty far from only open restroom/showers but we made it work. Level concrete sites with good hookups. Have friends in the area and will always stay at Reunion Lake when visiting Ponchatoula. We are from Texas, and will definitely return ! The owner and GM are just as everyone describes, they really care and listen to suggestions ! The owner is a past Louisiana Police Officer, so he does not put up with any bull - which we like ! A couple of things to mention, they have a high-definition cable system at the campsites. This means not all TV's work, but they did the required upgrades coming to all of us now, so eventually we will all have to comply. This means, depending on your TV age, the cable might not work at your site. Don't worry, if you get in a jam, there are several stations you can scan over antenna as a backup. Also, they told us they were going to make a change on their billing, you should be able to get a Folio printout with your charges as you leave, or have one emailed to you if you do not settle when you checkout and are charged. We had a minor issue, which they fixed immediately, but realized a change was in order to help everyone. Great destination for families ! Can't wait to return. This is truly a 5 star resort. They have thought of everything you would like in a resort, from the 2 swim up bars, tiki bar, golf cart rentals, great food even delivered to your site to lots of fun equipment for everyone. Staff was friendly. I would highly recommend this place for any age looking to have a great time. We would definitely go back. Wish there were more rv parks like this one. Only down side - you need to make weekend reservations far in advance as we were only able to stay 2 days because the weekends were full. We camped in a motorhome. When we stayed it was during the week after kids were back in school so there were very few spots occupied. Beautiful resort. Definitely a family type resort as there are tons of stuff for kids. Everything was clean and well maintained. Second time camping there. Once last year and once this year. Love the new lazy river and floating island. Also, like the change to all day pricing for the lake attractions. The staff was very helpful and friendly. Only draw back was the restrooms did get muddy toward the end of the day (we were there on what I was told was the busiest week this year). Also, found one of the bathrooms a bit out of order in the morning. Told a staff member who said they would get someone to address it, but several hours later it was still not taken care of. Arrived from California not knowing the area or facility. It is outstanding. New, owner motivated, plenty for kids and adults to do. Been in lots of RV parks over 30+ years and this is at the top. Check out their website it is all that they advertised. Extreamly clean and large concrete spaces for the biggest of rigs. No, we don't know the owner. Thank you for the review! We love hearing that campers from all over the U.S. love our resort! Hope you'll come back and visit again! Devoid of trees, shade. Wasps in site box, but staff came quickly to spray. Made us wear hospital-like wrist bands even though we didn't plan to charge drinks on our card; note this band is however good idea for ordering drinks at either swimming pool wet bars. Super fun pools for kids and adults. Great bathrooms w/showers. Thank you for the review! We are sorry the wristbands were an inconvenience to you. We asks all guests to wear wristbands to keep track of who is registered in the park. This helps limit overcrowding and helps us keep our guests safe and secure! To help with the lack of shade, we recently planted 50 trees throughout the park, now we are just waiting for them to grow! Hopefully your next stay with us is more enjoyable. Please come back and visit again soon! Level concrete pads and easy utility hookups. Plenty of room to park the toad behind our 40' coach. Park was pretty full as it was Memorial Day weekend but the staff handled everything well. Due to heavy rains there was lots of mud and many of the dog park users didn't pick up after their pets so it was not a place we wanted to let the dogs run. Laundry was clean and showers/restrooms were in great shape. We had to change our reservations a couple times and the staff was very accommodating and pleasant to work with. We plan to stay again on our way home from our cross country trip. Hopefully the rain will be gone. Where to start? Be prepared at check-in to receive a wrist band. I felt like I was being admitted to a hospital. I really don't see the necessity for the wrist bands for anyone not paying extra to use the extra amenities. We didn't use the lake activities just the free ones. That being said, this park has it all to be a destination! There are separate pools for adults and children. There is a huge adults-only hot tub for which you must have a blue or green wrist band. Obviously, that is not enforced as there were two young boys swimming laps in it and they were completely ignored by the roving security officer! The Lazy River is so much fun! There are lake activities and they looked amazing for kids but they are very pricy- $25.00 per day per person. Unfortunately for us there was a lot of rain. Our site was so muddy we couldn't even walk on the "grassy" area. The WiFi was ok but it is an extra charge. This place is going to be huge when finished! We would like to return in a few years when the grass has time to grow and fill in so it's less muddy! We stayed here for just one night while traveling. The facility is very nice and clean with concrete roads and pads. We were disappointed when we went to the camp store on a Tuesday and the sign said it was closed. It was only open for 3 days a week I believe, something stating the hours on the welcome paperwork would have been helpful, I had taken a fall and was kind of hard to walk all the way over there just to find out it was closed. I thought it was a bit pricey at $72.80 per night plus we were charged $8.00 per day for WIFI. That is high! We were traveling and tired so we paid it because we needed to pay some bills online. I also noticed that they charge for the water attractions, I would think that would be included in the high price of staying here. For an overnight stay it was nice, but I think they need to revisit their pricing or at lease make it all inclusive, families cannot afford $25 per day per kid or $100 a week per kid to use the water attractions part of their park, I have never seen a RV Resort charge for those things. We were there in May before Memorial Day weekend. We have been to many RV camp sites around Louisiana and the gulf coast. Reunion lake is tops on our list. When we want to get away this is where we now head to. Actually Reunion lake is the only place we go to now. The park is great for kids and a great place to just relax. I can not say enough about the staff, they are so polite and always willing to help. What really makes Reunion Lake special is the owner and manager. They are there every day and actually take the time to stop and talk to everyone. This is by far the ONLY 1st class RV camp site in the state. I can not wait to see the second phase finished, it was so close last time we were there. I already have memorial day weekend booked, in the new Phase 2 section. Can not wait to get in the lazy River. As their slogan says this is the place where memories are made, and they do a SUPER JOB at this. See you guys again soon. Thanks for the five star review Chris! We are so glad to hear Reunion is NUMBER ONE in your book! Hospitality is always our top priority and we are happy to hear that it shows! Can't wait to have you back this summer! This place advertises itself as a snowbirds paradise however that's false advertising. On Monday, 27 Feb 17 we snowbirds stopped over for one night. The amenities/ facilities that attracted us here (bar, grill, gift shop) are closed everyday but Friday and Saturday. A note to management, snowbirds often travel during the week. Further, since these facilities are not available they should have lower rates. We paid $60 for the one night. Wi-fi was an extra $7.50 for the night. Expensive and disappointing for the winter traveler, aka, snowbird. We are terribly sorry you were disappointed with your stay. All of the resort hours of operation can be found under the reservations tab on our website. Our winter rates run between $45-55 /night depending on your choice of site. We also offer discounts for Good Sam's Club, senior citizen, and military. We are sorry we were unable to meet your expectations and hope to be better in the future. Thank you for your feedback. Realistic Snowbird Review Ending a 1-Month Stay When we booked Reunion Lake we did so because of the amenities listed on their website specifically for snowbirds. We were extremely disappointed that the website isn’t only very misleading - it’s a flat out lie!. The website specifically states “We cater to snowbird campers nationwide!” It continues with “Open 365 Days a Year” “There’s no off-season at Reunion Lake! 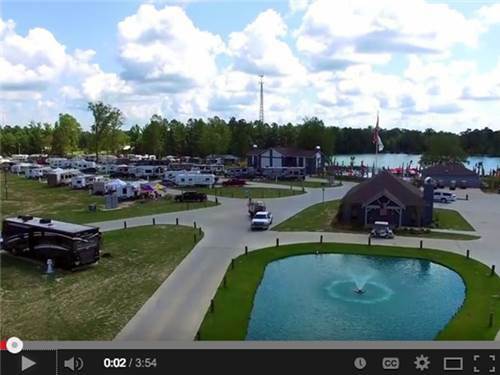 Visit us any time of year, any season, and enjoy year round entertainment and amenities at the south’s most luxurious RV Park”. These statements are quoted from their web site. We found many amenities “closed for the season” to reopen April 1st - this is in stark contrast to their website statements. While the outdoor deck overlooking the lake is available, the “Adult-only pool with swim-up bar” that was listed as available to snowbirds was closed for the season, the adult-only pool was accessible, but so cold you could not go past your ankles. The family pool was accessible, however it too was ice cold - no one was getting in. The website also lists that it will have activities for kids at the family pool - what activity, we never saw any kids activities! The “Giant outdoor amphitheater” that was listed as a snowbird activity was never used the entire month we were here, even though there were ample opportunities available with the airings of the national football playoffs and Super Bowl. How about that fitness center they say they have, well, it’s one treadmill, one stationary bike, and a TV that plays 1 station - ESPN - hardly a fitness center (yes, we did inform the front desk of the TV situation and as of this review it still only has 1 station). The Founders Lounge was listed as being open Friday - Sunday - nope, that’s not correct either, they're closed on Sundays. How about that Poolside Grill that is supposed to be open Friday and Saturday, November - March? Well, it’s closed for the season also! Where’s the pool tables? Well, the pool tables are available at the Founders Lounge which is open Fridays and Saturdays beginning at 4pm, and you have to feed them quarters! Would you like to attend any snowbird activity, say a horseshoe tournament, shuffleboard contest, corn hole get-together, or maybe a pot-luck lunch or dinner? Nope, not happening here! Nope, no activities for snowbirds here at Reunion Lake. Should we go on to discuss the campers who have made this so called luxurious RV Park catering to snowbirds their residence, yes it’s happening folks - we have one right next to us, and when they're up getting ready for school and work, and letting the dog run about campsites, we have no choice but to be awake also! So in closing, if you are a snowbird looking for a snowbird park with amenities available and open for your use, you may want to bypass this one! We are extremely sorry you were disappointed in your stay with us. We appreciate your honest feedback and hope to one day meet your expectation of what a "snowbird destination" should be. The grounds, the sites, the amenities are great. The site we had is one of the best we have stayed on. Plenty of room and well thought out for Class A or a trailer. Everything was great, except the restrooms. Nice facilities, 12 full bathrooms. Our problem was they seemed to be only cleaned once a week. Often found them muddy, or dirty or well used. My other complaint is laundry. Not enough equipment and many residents wash their pet bedding. Nothing worse than finding a washer or dryer full of pet hair. Yuk. Thank you for your well thought out comments! When we built our park, a lot of time and effort went into planning each and every site. On the other hand, we sincerely apologize that the bath house was not up to par. We try our best to keep the bath house clean. Next time you're with us and you see something you don't like, please be sure to let a staff member know and we will take care of it immediately! Our stay was a bit disappointing. The park is still under construction, we wish it would have said that in the website. It will be beautiful when completed. I suggest when making reservations you ask where they are in the construction process. Also, spend the extra few dollars to be by the water. We are very sorry you were disappointed in your stay. We are working extremely hard to finish with Phase II of construction as swiftly as possible. Hopefully, the next time you stay with us, Reunion Lake will be as beautiful as it's meant to be! Looks like a construction site. Flooding and charging us for internet when it was supposed to be included - everything is closed on a nice sunny 81 degree Friday afternoon - the pool is locked up and we can't even enter while the store is closed. Go somewhere else. You can see they put a lot of money into the place but it is not ready yet - maybe try it next year. We apologize for the inconvenience of Phase II construction. We are working as fast as we can to meet our Summer deadline. Since our opening day, we have always tried to make it clear to guests that we charge for WiFi. The pricing information is listed on our website and our office staff are always happy to inform potential guests of the charges as well. All of our amenities will open up April 1st, when our summer season begins. Reunion lake was a excellent campground but there are a few things that were disappointing at this time. First we were charged full rates but most of the services were closed down as the season has ended. We were told that the off-season rates would start in a week but when you shut services off they should've started off-season rates now. Also shower facilities were limited and far away for a park this size. There are no trees at most sites and it is very sunny and hot. We know this is a new park so hopefully something can be done for shade in the future. That being said this is a very nice facility that can grow into an exceptinal one with a few minor changes over time. We would recommend it to everyone if you are ever in the area. Thank you for your feedback! We appreciate any comments or suggestions our guests may have. After seeing your review, we made sure to add our fall hours to our website. When we begin phase II, it is one of our goals to add more trees throughout the park. Another bathhouse is also in the works for phase II. With the changes we are implementing, we hope your next stay with us will prove that we can be an exceptional facility! Just finished another fantastic stay at Reunion Lake!! The facility and staff amazing!!! If you haven't done so yet make a reservation soon and give this wonderful place a try....you won't regret it !!! Thanks for the great review! Our staff always works hard to deliver excellent service to every guest! We take pride in our facilities too! We want to make sure each and every camper gets to experience what Reunion lake has to offer. Hope to see you again soon! Where do I start??? From the minute we drove into the park, I knew this was going to be a great place. The staff at the Welcome Center were very friendly and made sure that we knew of everything they had to offer us as guests. As soon as we were checked in; a couple of staff members escorted us to our campsite, which by the way is very nice! We had a pull-through space that accommodated our tow vehicle and one other vehicle. All hook-ups are conveniently located in one place. There was also extra parking nearby for cars and trailers if you bring a golf cart. Throughout the weekend, our family had a great time! We met the owner who was always around meeting and greeting guests and making sure everything was perfect for your stay. I had a minor issue with wi-fi and when I mentioned it to him, he was on top of it immediately sending over his brother, who is in charge of wi-fi, to our site to make sure all was in working order. The family pool area is great, very clean and there was always a member of the staff walking around taking orders for food or drinks or just tidying up; the kids had a blast there!! The adult pool area is awesome with the swim-up bar; not as crowded as the family pool so very nice to be able to relax and have a drink or something to eat if you’re at the park with no kids. The Pool Side Grill has great food and snacks for reasonable prices as does the bar, so if you don't feel like going back to your campsite for food and drinks, it's all right there for you...and they will even deliver to your table or lounge chairs!! The Founder's Club lounge is beautiful with a huge outdoor deck overlooking the lake, which is perfect if you want to have a few drinks and enjoy the view. There is so much to offer that in the time we were there, we managed to take advantage of the kids craft and play time, the paddle boards and kayaks, the adult pool and bar, the family pool, the Camp Store, which has pretty much all those incidentals that you may have forgotten, the Founder's Club lounge, listened to the live music Sunday night and watched the fireworks from our campsite. Our days were so full with those things, we didn’t get to visit the game room, fitness room or take advantage of the other activities offered. All in all, it was a great weekend!!! The entire staff was so friendly and ready to take care of anything we needed. I highly recommend Reunion Lake RV Resort to anyone considering camping in South Louisiana!! We've already booked our next trip and looking forward to it. Thank you for a wonderful July 4th weekend!! This is the best place we've ever been (been camping my whole life 34yrs.) The owner/employee's are All friendly and courteous! Sites are level, roads are wide and easy to navigate, everything has been wonderful since opening day! There's two pools, one for adults/kids & one with a swim up bar, for 18&over. 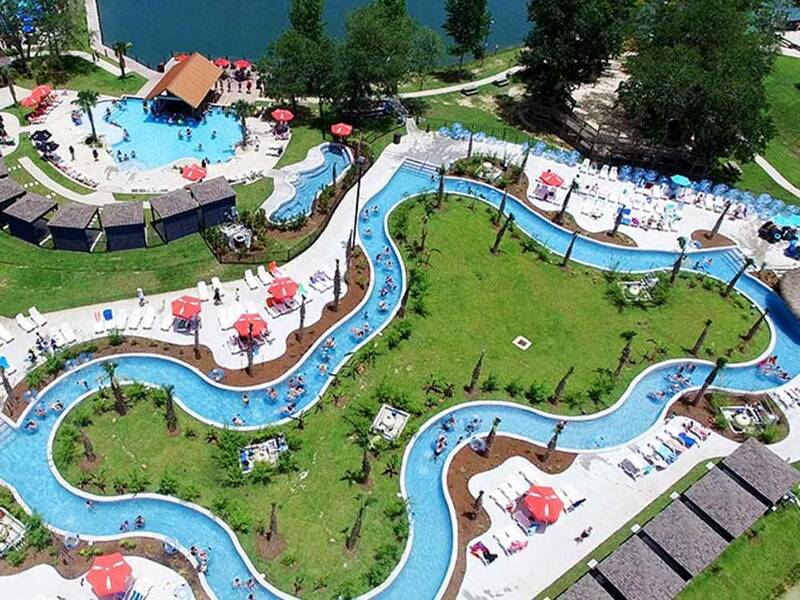 Lake activities, fishing, golf carts, big screen outdoor movies at night, music playing at pools, a restaurant open for lunch& dinner, and two bars onsite! If your planning to visit New Orleans, it's an easy 40-60 min drive, since Reuinion lake is right off I-12(but u can NOT hear it at all) no worries! Don't take my word for it, come check it out yourself! Best choice in the area, I promise! We stayed at RL this past weekend (Memorial Day). Considering the resort has just opened AND it was a very busy holiday weekend, the staff and owners were doing a great job keeping everyone happy! The owner came by personally on several occasions and asked how things were going. The staff was helpful and courteous even though they were extremely busy. Can't say enough about the campground! Everything was great. We enjoyed the beautiful pools (one for kids, one for adults with swim up bar), the lake is greatl and everything is kept very clean. The sites are paved and the hook ups are very easy to use (we had a back in space, but there are pull-throughs). We did not feel cramped in our space at all. Lots of room for our golf cart, outdoor kitchen, table, and chairs, etc. The activities put on by the resort are awesome (movie night by the lake was my favorite). Even though we didn't bring our pets, the resort is very pet friendly. There were lots of people with dogs and I'm sure they appreciated the dog park and dog washing station. We had a ton of fun and met lots of new people. The location of the park is great since it's right on I-12 and has easy accessibility to many local attractions. We only live a few minutes away from the park, but have been looking forward to giving it a try and were not disappointed. The only drawback is there are not a lot of trees for share near some of the sites, but the rest of the facility is perfect. I did hear some negative feedback that there was a charge for extra guests and for paddle boarding and the kayaks, etc., but honestly the fees were reasonable in my opinion. It's not a state park, it's privately owned, so we expected this and I didn't think any of the charges were out of line. Seems like the management has done everything they can to make it a great place. We made some great memories here and will be back! THANKS FOR THE GREAT FEEDBACK. WE ARE DOING OUR BEST TO GIVE THE BEST SERVICE AND AMENITIES AND THE INDUSTRY. PHASE 2 HAS A LOT OF SHADE WITH AWESOME CONDOS AND PHASE 1 WILL BE GETTING MORE THIS FALL, COME SEE US. MEMORIES ARE MADE HERE. Great place to stay. It has a camping and resort appeal - which is hard to pull off. All staff were super friendly and helpful. It is definitely a cool place to camp. Plenty of things for kids to do and they loved the pool. THANK YOU! WE HOPE TO SEE YOU AND YOUR FAMILY AGAIN SOON... MEMORIES ARE MADE HERE. First class RV Resort! They have something for everyone! Kids pool and activities, paddle boarding, kayaking, music, and great food! The adult pool has a swim up bar and cabanas for relaxing! The staff was friendly and helpful all weekend! Nothing negative about this RV Park at all, except we had to go home:) We will be back! thank you for the great comments. there is a lot to do for sure. we look forward to seeing yall again soon... memories are made here!!! The most thought out resort I have seen. If you are going to be traveling thru Louisiana on I12 this is a must stop! First and foremost, no day passes. This means you the guest get to fully enjoy the emenities. Pet friendly, no loud music allowed on golf carts. The owner has accumulated the most hospitable staff. This resort just opened 2weeks ago and the next phases of this park should create a new scale of rating for Good SAMs , like maybe 15/15/15. These guys are into detail. Don't miss this place! THANK YOU... OUR COMMITMENT IS TO THE CAMPERS THAT WE HOST AND TO GIVING THEM THE BEST SERVICE AND FACILITIES IN THE INDUSTRY. COME SEE US AGAIN SOON. MEMORIES ARE MADE HERE. I could not have dreamed up a more pleasurable experience for my family, friends, and I to have spent our Memorial day weekend. If the only amenities this campground had were a pile of sand and a shovel it wouldn't even matter because the hospitality and feeling of being part of a temporary camping "family" surpasses the value of it all. We were welcomed warmly and there was not a single instance where an employee of reunion lake did not pass us either waving, saying hello, or asking if we needed something. Scott is a terrific owner and doesn't just take time to say a simple hello, but actually takes time to try to get to know each and every guest. The pools were very well kept and cared for and all of the bar staff was top notch. We will be back again and again! THANK YOU FOR THE NICE COMPLIMENT.... I AM SO PROUD OF OUR YOUNG STAFF, AS THE OWNER, ITS A GREAT FEELING TO SEE THEM LEARNING OUR PHILOSOPHY OF HOSPITALITY AND THEN GETTING THIS KIND OF FEEDBACK... COULD'NT BE MORE PROUD OF OUR TEAM. THANKS AGAIN. COME SEE US AGAIN SOON. MEMORIES ARE MADE HERE. We try to camp at least twice a month in the Lousiana/ Mississippi area in our 32' travel trailer. We've been to 30+ different RV parks within our 5 years of camping. I'm not one to write reviews but this RV Park is different. The park is top notch with the staff to match. The difference to me is, the owner. He is extremely passionate about every one of us having a great time. He actually stops to speak with everyone to inquire how we are enjoying our trip. I HIGHLY recommend coming here.